Jiminy's Journals (ジミニーメモ, Jiminī Memo?) are journals written by Jiminy Cricket, containing information on Sora and the countless number of things he meets and discovers on his journeys through the Kingdom Hearts universe. Being a form of Report, the journal contains sections on the Heartless, other characters, story plots, notes on the worlds, mini-games, treasure chests opened, Trinity Marks (Kingdom Hearts) and hints of what to do next (Kingdom Hearts II). However, Jiminy's first journal is wiped clean at the beginning of Kingdom Hearts Chain of Memories and again at the end, with only one sentence left: "Thank Naminé." 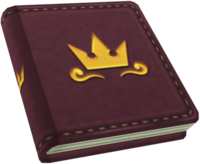 The Journal is the first object to become a character in the Kingdom Hearts series, first appearing in Kingdom Hearts coded. Because of the Journal being used as both a character and plot device in Kingdom Hearts coded, it is replaced in actual gameplay with a Computer System report which holds all information collected within the game and statistics. Jiminy is assigned by Queen Minnie to chronicle Donald and Goofy's quest to find the "key". Jiminy introduces his journal to Sora after defeating the Guard Armor in Traverse Town. Jiminy rewrites the journal entries as the party learns more about the ongoing situation, and does not keep records of prior drafts. Once the team enters Castle Oblivion, Naminé uses her witchcraft to cause them to see the journal as blank. Jiminy refills the journal with the events of the castle, but after rescuing Naminé, the team learns that they will have to sacrifice their memories of the castle in order to heal Sora, including the words written in the journal. In order to remind themselves of their debt to Naminé, Jiminy writes the phrase "Thank Naminé" on the last page of the journal. When Sora and his friends awaken in the Old Mansion, they look through the Journal for hints as to how they got there, but only find Jiminy's message about Naminé. In response, Jiminy begins a second journal to begin chronicling their continuing journey, but keeps the old journal with him. The mysterious message found in the journal by Jiminy. After the team vanquishes Xemnas and Jiminy returns to Disney Castle, he goes to organize his journals, but finds a message that he did not write: "Their hurting will be mended when you return to end it." Jiminy asks King Mickey what to make of the message, but the King does not know, so at Chip and Dale's suggestion they decide to digitize the contents of the journal. Discovering that the data is filled with bugs, they create a Data-Sora to explore the Datascape created from the journal's contents and debug the data. Jiminy's Journal in Data-Riku's Form. Soon after, a mysterious man clad in a black coat appears and reveals himself to be a Data-Riku, who has been given possession of the Journal's memories. Data-Riku guides Data-Sora as he destroys the bugs in each of the worlds in the journal, but he is kidnapped by Pete and Maleficent, who infest him with Bug Blox. Data-Sora battles Data-Riku, and enters his data to free them of the Bug Blox. When the data in the Journal is completely debugged, Data-Sora loses his memories. After the loss of the Data-Sora's memories, Mickey finds him in Traverse Town and takes him to a data version of Castle Oblivion. There, they meet and battle a Data-Roxas and eventually find a Data-Naminé. She tells them that the bugs were a side-effect of the real Naminé's tampering with Sora's memories, and that she summoned them there to inform them that those connected to the real Sora's heart are hurting and that Sora must venture out to save them from their individual fates. After Sora is sent the Gummiphone by Chip and Dale, Jiminy decides to write his journal entries inside of it. Jiminy's Journal has many contents pages, slightly differing between games. In general, each game's Journal includes entries on defeated Heartless and, in the case of Kingdom Hearts II, Nobodies. The entries feature a brief description of the Heartless, sometimes mentioning an attack of theirs or the main world that they appear in, and mentioning how many have been defeated. They all also include entries on the characters encountered over the course of the game; anybody that Sora meets is added, unless they are generic characters (such as Traverse Town's townsfolk). If the character added is from a Final Fantasy game or a Disney film, their first appearance is noted as well. Main sections of Jiminy's Journal in Kingdom Hearts. Chronicles: tells Sora's adventure world-by-world in story format, with the exclusion of the Destiny Islands, Traverse Town, and End of the World. There is also a subsection called "Sora's Story" which details major plot events in the game. Ansem's Report: documents the pages from Ansem's Report for the player to read. Characters: provides character profiles and brief descriptions. Characters I: general Kingdom Hearts characters such as Donald Duck or Sora, and characters from Final Fantasy. Characters II: all the world-specific Disney characters and the Summon characters. 101 Dalmatians: checks off each of the 99 Puppies that Sora finds. Trinity Marks: numbers Sora's usage of Trinity Marks. Mini-Games: records Sora's records on mini-games. By pressing while investigating an entry, the player may view and rotate the concerning character or Heartless's trophy. The journal as it appears in Kingdom Hearts Chain of Memories. The Journal in this game is like that in Kingdom Hearts, but in this game it splits into three main areas. Story: summarizes each world's storyline, as well as Sora's own story as he goes through Castle Oblivion. Card Index: separates the cards by types, such as Attack, Magic, Map, and Enemy. It gives a description of each card and what it does. Characters: gives brief descriptions of the game's characters. Characters I: main characters, Final Fantasy characters, summons, and appearing members of Organization XIII. Characters II: characters for each world Sora visits. Heartless: gives information about each Heartless. Characters: gives brief descriptions of the game's characters, organized by the world in which they appear in. Card Index: shows a graphical view of all collected cards of any type. Cards: separates the cards by types, such as Attack, Magic, Map, and Enemy. It gives a description of each card and what it does. Minigames: Displays quantitative records and data on Sora's performance in mini-games. Main sections in Jiminy's Journal in Kingdom Hearts II. The contents of the new Jiminy's Journal are separated by world. All world-specific characters may be viewed under "Characters" while viewing their world. For example, the player may choose Beast's Castle and then choose "Characters" if they want to view Beast's entry. The Characters screen is different than in the previous games. Instead of a list of characters, it shows a small square with a picture of the character, divided into related groups. Sora, Donald, and Goofy all have entries under every world, with little difference in all world entries other than that of the Timeless River, Atlantica, Halloween Town, the Pride Lands, and Space Paranoids. Any non-world specific characters, such as the Summon characters and discarded entries, such as that of a cloaked Organization XIII member after the real identity receives an article, or the defeated Heartless and Nobodies, appear under the "Jiminy" selection, symbolized by a picture of Jiminy. The enemies and characters which Roxas encounters during his week in the simulated Twilight Town are not recorded in the journal until Sora either encounters them himself, or in the case of the Twilight Thorn, enters the simulated Twilight Town. Meanwhile, in Kingdom Hearts II, the Organization XIII members who died in Castle Oblivion (Vexen, Lexaeus, Zexion, Marluxia, Larxene) are added to the journal once Sora enters the password for the DTD and accesses Ansem's computer files. In Kingdom Hearts II Final Mix, these journal pages are instead added individually, when Sora fights the respective Absent Silhouette. In addition, the journal mistakenly claims that the Twilight Town trio were attacked by Heartless, when they were actually attacked by Nobodies. Ansem Reports: displays the Secret Ansem Reports. Character Files: displays brief character descriptions. The Heartless: displays information and tips on the breeds of Heartless. The Nobodies: displays information and tips on the breeds of Nobodies. Treasures: displays treasures found and still hidden in each world. Puzzles: shows puzzle pieces collected and still hidden in each world, and allows player to solve the puzzles for rewards. Only in Kingdom Hearts II Final Mix. Synthesis Notes: displays data on past items synthesized. Minigames: displays all minigames previously played and the record for those minigames. Missions: displays achievements tied to certain minigames. Limits displays each Limit and the record of maximum hits for those Limits. Character Links: displays the characters for each world and the game as a whole in a grid-like sociogram, depicting their roles and relationships to other characters. In the "Character Links", the colors of the squares containing the faces of the characters determine the characters' alignment, except for several profiles in Port Royal and Halloween Town. Blue indicates that they are heroes. Green indicates that they are friends. Yellow could very well indicate that they are neutral characters. Red indicates that they are enemies. Black indicates that they are other characters. Grey indicates that they are a member of Organization XIII. Ansem the Wise and King Mickey are grouped on the upper left corner. Naminé is on the upper right corner. Donald Duck, Goofy, Riku, Sora, and Kairi are grouped at the top center. Maleficent, Pete, Xehanort, and the Lingering Will (only in Kingdom Hearts II Final Mix) are in the lower left corner. Organization XIII is arranged in rows of multiples of two, except Xemnas, for he is slightly under the middle right side. ↑ In Kingdom Hearts coded, the message is "We must return to free them from their torment." ↑ Kingdom Hearts II, Twilight Town's report entry: "Sora and his friends came by the mansion searching for clues, only to find Hayner and his friends recovering after being attacked by Heartless." ↑ Kingdom Hearts II, Hayner: "We came here looking for Kairi. Then those white things attacked us..."
↑ Titled Combo Attacks in the original Kingdom Hearts II.